Let's start with, "What are toxins?" Toxins are chemicals known to have unfavorable effects on the human body. They can be found in food (or substances used in growing food), water and even in the air. Toxins are processed through organs like the liver and kidneys and are eliminated through perspiration, urination and bowel movements. Those that promote detox diets believe that toxins don't completely leave our bodies through these natural processes and instead they linger in the digestive or lymph systems, and can cause harmful effects such as headaches or fatigue. These type of diets require giving up specific foods that may contain toxins in order to purge the body of them, and initially involve a fast; you are required to completely go without food for two days and then you gradually introduce specified foods back into your diet. Most detox diets also encourage some sort of "cleansing" process via a colonic irrigation or by the use of enemas. Some detox plans may also recommend the use of supplements or laxatives to aid in the purification process. It is believed that these types of diets do anything from increasing energy levels to preventing... or even curing... health conditions. This sounds great! But do Detox Diets help you lose weight? Many people believe they can lose weight with detox diets, but these plans are not the best method for healthful, permanent weight-loss results. Diets that involve fasting or restriction of entire food groups are not ideal for everyone. While people who fast do seem to lose weight, this weight is water loss not fat loss (which is what you need to achieve in order to permanently reduce your weight). This type of crash dieting can lead to muscle loss, and if done on a regular basis can cause the metabolism to slow down. Children, teenagers, diabetics, pregnant women, those with heart disease, or anyone suffering from medical conditions should not follow a detox diet. Anyone with an eating disorder should not follow this type of diet. Additionally, these diets are not appropriate for people who are very active, have physically demanding jobs or participate in sports, because they do not provide sufficient energy or nutrition. A detox diet is a short-term diet, often three to 21 days, focused on removing toxins from the body. Although detoxification is ongoing in the body, toxins and stress prevent us from doing it optimally, which can eventually affect other systems in the body. This diet allows our bodies to focus on self-healing, with the goal being to raise energy levels, stimulate digestive health, clear headaches, remove bloating, improve concentration and mood, avoid getting allergies, regain our natural ability to ward off colds and flu, and prevent premature aging and disease. 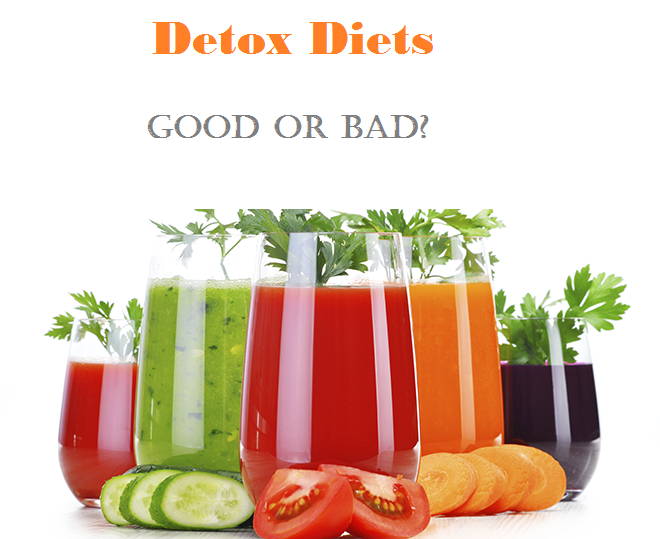 Considering the touted benefits, it's easy to see why a detox diet may appeal to some. If you're considering a detox diet, it's important to consult with your doctor prior to starting. Keep in mind that these diets are not intended to cure disease. Instead, they are designed to clear obstacles to health and allow all body systems to run more efficiently. The Master Cleanse: Also called the "lemonade diet," is a fast that involves drinking only lemonade, grade B maple syrup and cayenne pepper. Juice Fasting: A type of fast that calls for consuming only fresh vegetable and fruit juices, such as beet juice and wheatgrass juice, and water. Juice fasts include the Blueprint Cleanse. Smoothie and shake fasting: Involves drinking pureed or blended vegetable and fruit smoothies, especially green smoothies. Commercial cleanse programs: Specially designed protein powders, vitamins, nutrients for detoxification. Examples include the acai cleanse, Colon cleanse, and Bowltrol. Raw food detox diet: Based on the raw food diet. Involves only eating food that is raw or hasn't been heated above 118 degrees. Ayurvedic detox diet: An Ayurvedic cleansing and rejuvenation plan called pancha karma. Other diets can be used on their own as detox diets, including the brown rice diet, elimination diet, a candida cleanse, macrobiotic diet, and a digestive cleanse.